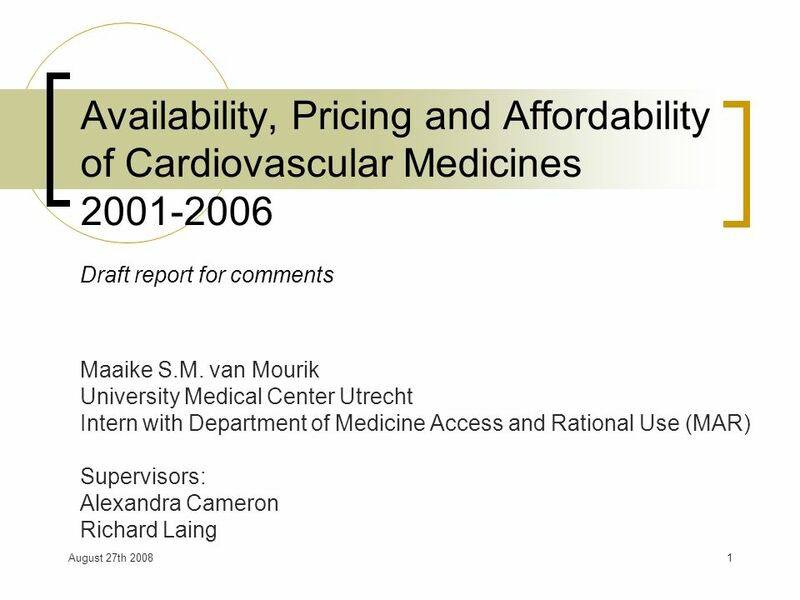 August 27th 20081 Availability, Pricing and Affordability of Cardiovascular Medicines 2001-2006 Draft report for comments Maaike S.M. van Mourik University. 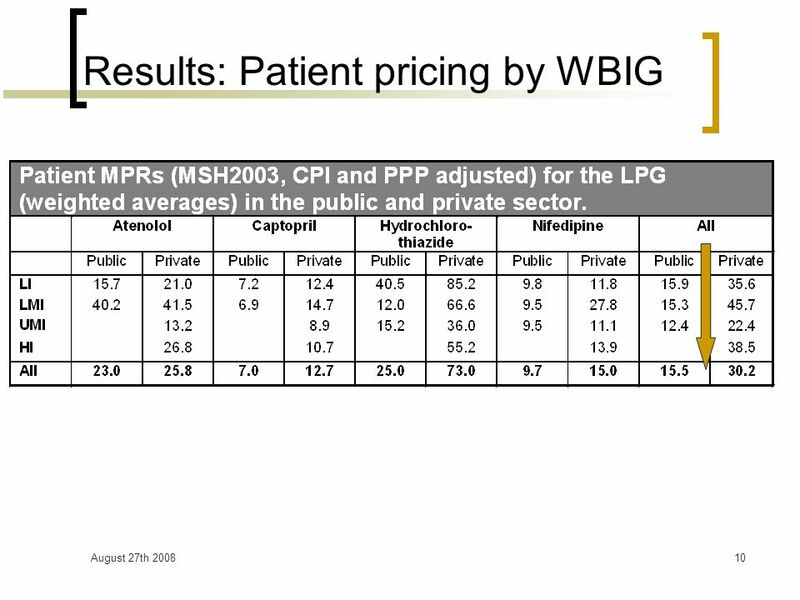 4 August 27th 20084 Methodology WHO/HAI data Standardized data collection Prices as Median Price Ratios (MPRs) Medicines: Atenolol 50mg, Captopril 25mg, Hydrochlorothiazide (HCT) 25mg, Losartan 50mg and Nifedipine retard 20mg. 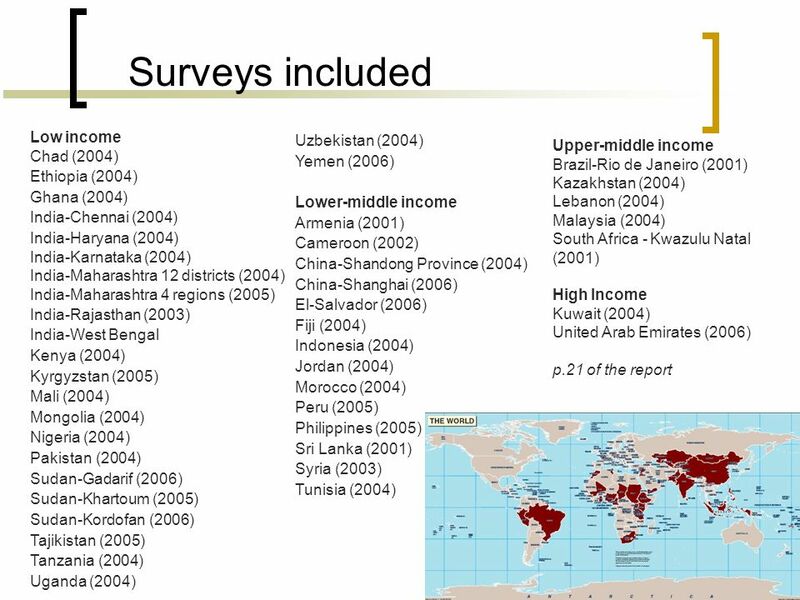 Secondary analysis Adjustments for inflation and purchasing power Analysis by World Bank Income Groups and WHO regions. 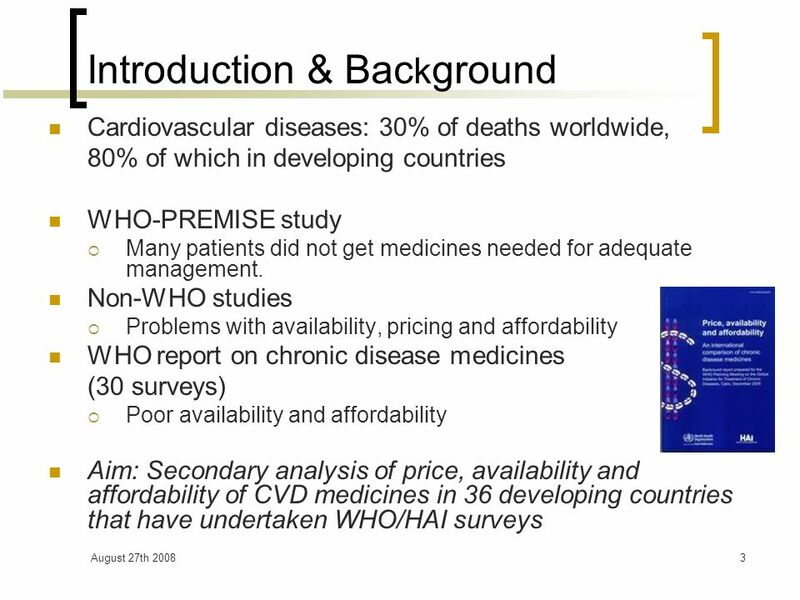 Download ppt "August 27th 20081 Availability, Pricing and Affordability of Cardiovascular Medicines 2001-2006 Draft report for comments Maaike S.M. 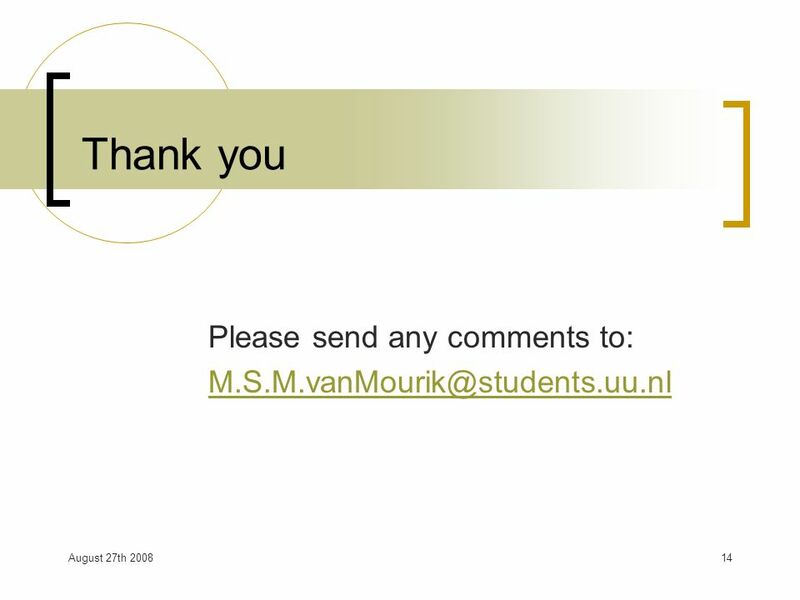 van Mourik University." Introduction of the Annual Report 1. Workshop towards equitable and affordable medicine prices policy in Jordan Dead Sea, Jordan Dead Sea, Jordan 4–5. 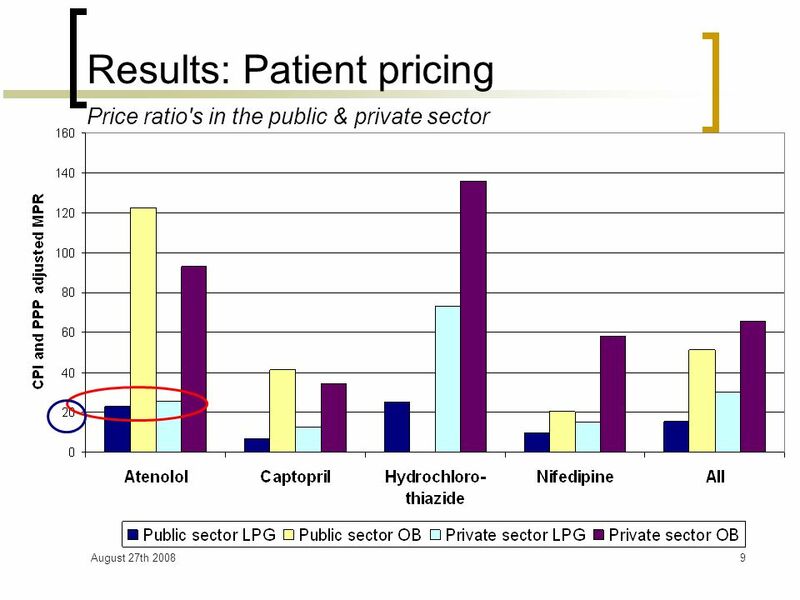 Medicine Prices Matter to People and Insurance Companies Margaret Ewen Health Action International. Direct costs and availability of diabetes medicines in low-income and middle-income countries Birgit Volman 27/08/2008 Meeting on Access to Medicines for. 1 What do we know about access to chronic disease medicines ? Dr Shanthi Mendis Coordinator Chronic Diseases Prevention and Management Department of Chronic. 1 Paying the Price Margaret Ewen Health Action International Europe. 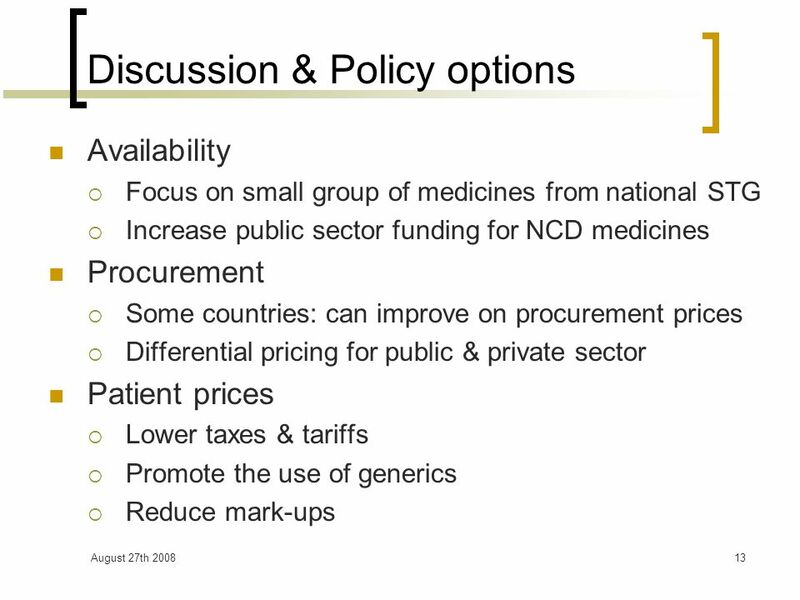 1 Policy options to address access to chronic disease medicines Dr. Richard Laing Ms. Alexandra Cameron Department of Essential Medicines and Pharmaceutical. 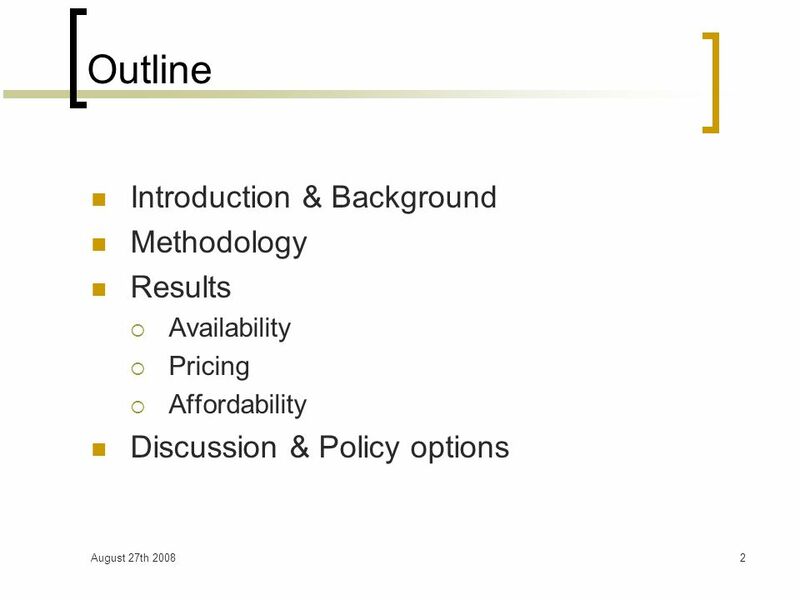 August 27th Availability, Pricing and Affordability of Asthma Medicines Presentation for Meeting on Availability, Pricing and Affordability. 1 Medicines for Chronic Diseases: too costly, too scarce, too important to ignore Margaret Ewen Health Action International. Strategies to Improve Efficiency in Medicine Procurement Towards equitable and affordable medicine prices policies in Jordan Workshop 4-5 Dec, 2007 Dr.
1 Medicine Availability, Prices and Affordability in West Bengal, India (2004) DALIA DEY CUTS & CDMU. 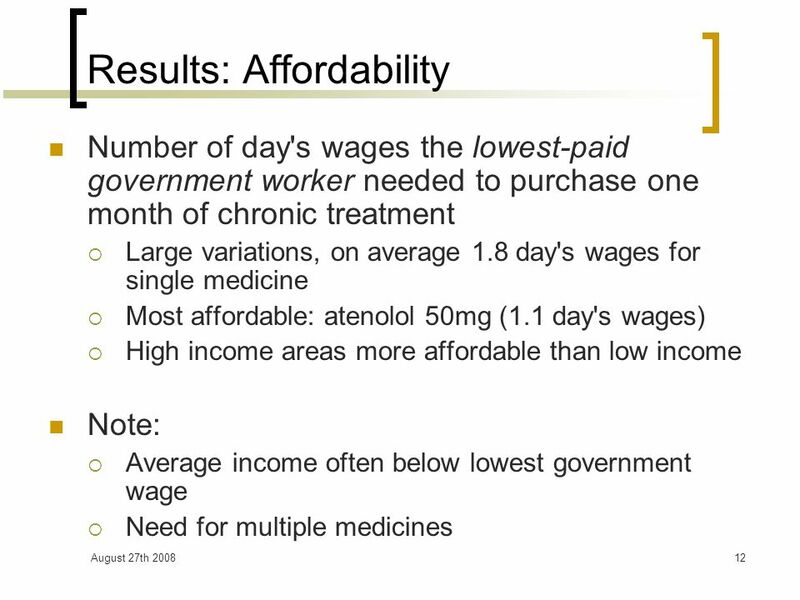 1 Medicine Prices, Availability and Affordability Margaret Ewen Health Action International. Lebanon, 2004 Medicine price survey in Lebanon, 2004 undertaken by Dr Rita Karam, Ministry of Health Marg Ewen (on behalf of Dr Karam) WHO/HAI post-medicine. 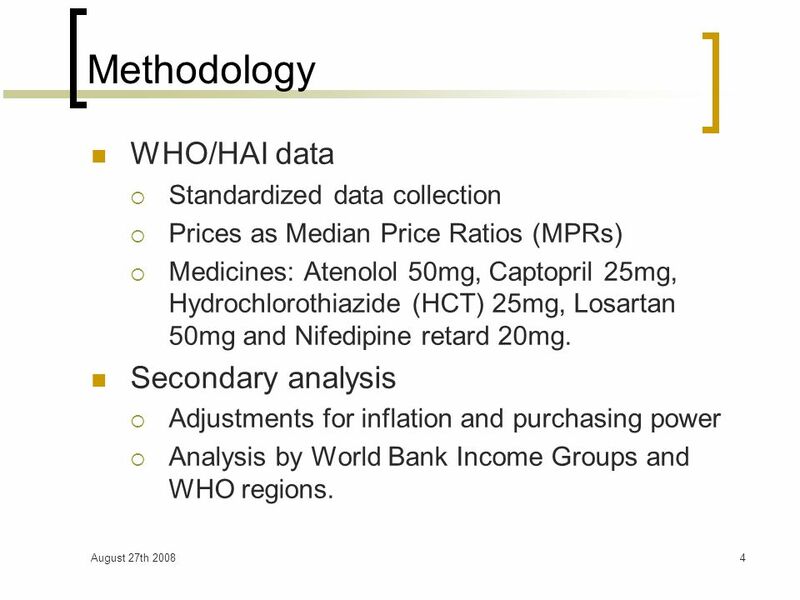 Overview of the medicine prices and availability survey methodology Presentation template for adaptation and use in medicine prices and availability survey. Syria,2004 Medicine price survey in Syria, 2004 undertaken by Pharmaceutical Studies Directorate, Ministry of Health Presentation by Razan Sallouta WHO/HAI. 1 Introduction to the medicine prices and availability survey and training workshop Presentation template for adaptation and use in medicine prices and. 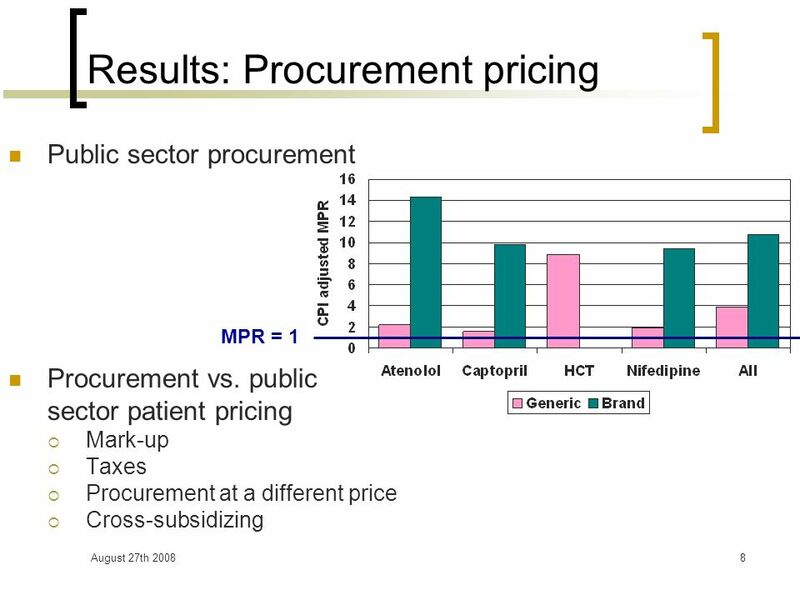 The prices of medicines worldwide & how they are determined Margaret Ewen Health Action International Europe Co-ordinator WHO/HAI Project on Medicine Prices. 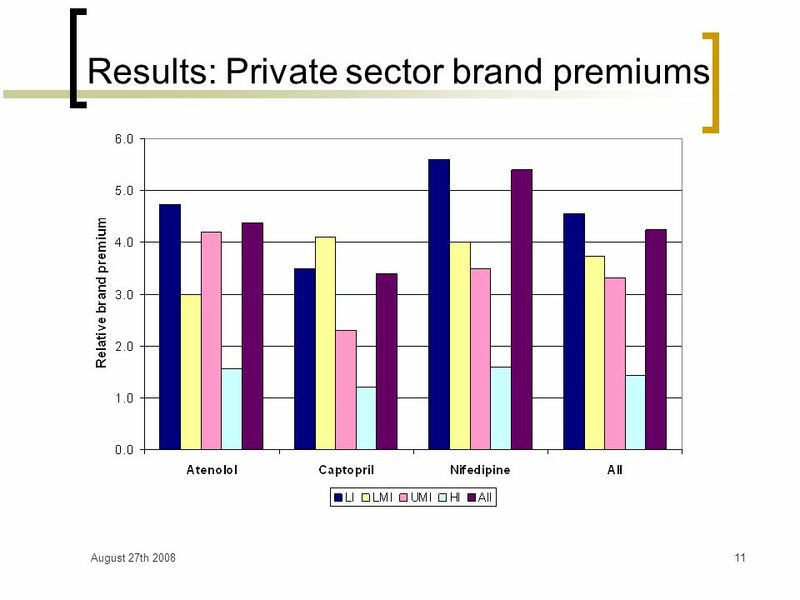 Measuring Medicine Prices and Availability – a new Methodology and few Indian Survey Results Dr. Anita Kotwani Department of Pharmacology Vallabhbhai Patel. MDG Target 8.E gap analysis Ms. Alexandra Cameron Department of Essential Medicines and Pharmaceutical Policies, World Health Organization 27 August 2008. 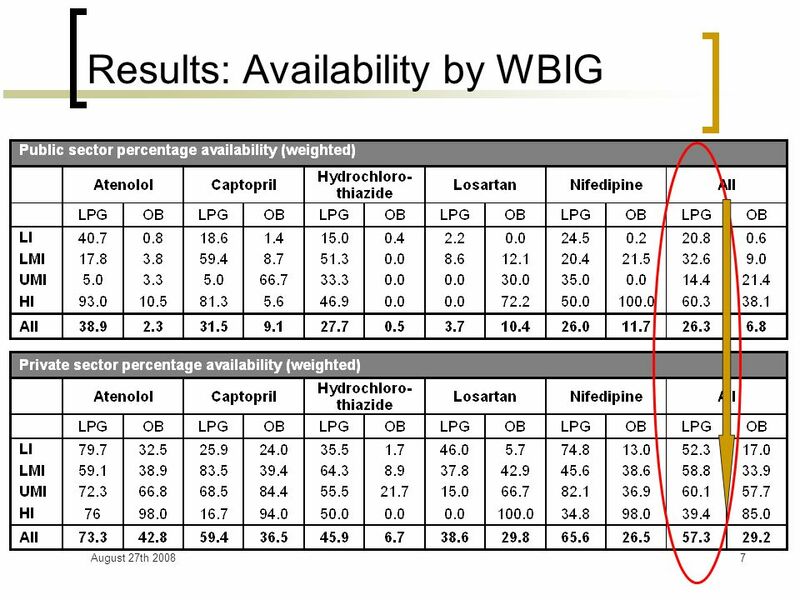 Price, availability and affordability of medicines international comparison of 29 surveys Presented by: Richard Laing World Health Organization, Geneva. 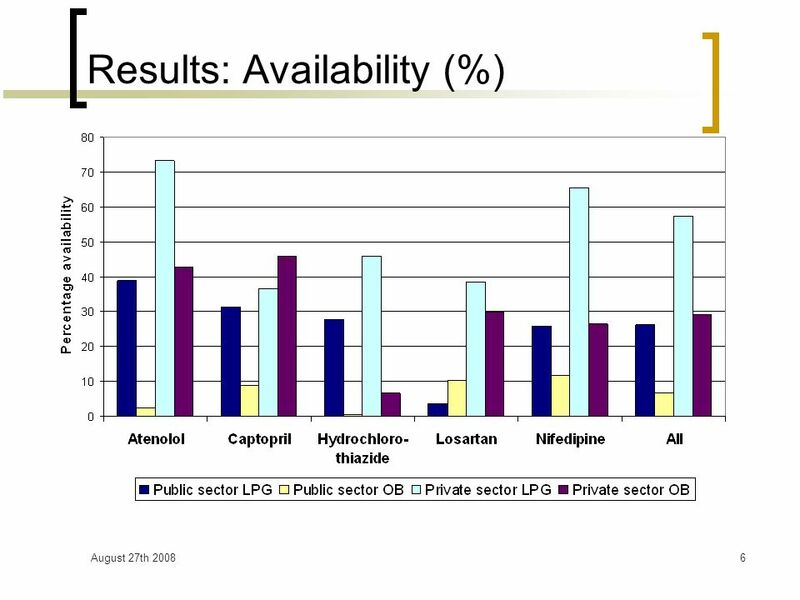 1 Generating reliable evidence: measuring medicine prices and availability Dr Richard Laing Department of Essential Medicines and Pharmaceutical Policy.